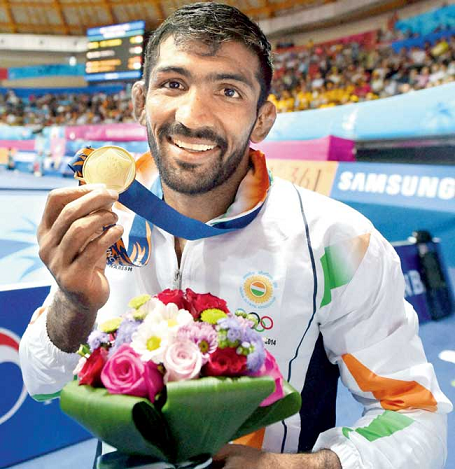 Yogeshwar Dutt is the third medal winner wrestler from India in Olympics. After Sushil Kumar’s Bronze in 2008 Olympics, Dutt won in Men’s 60kg category at London Olympics 2012. Since last Olympics, he won Gold medals at Asian Games and Commonwealth Games in 2014. Here is the complete profile of rare Olympic medal winner for India. Yogeshwar lost in the quarterfinals at his first appearance in Olympics at Beijing. On his way to Olympics Bronze at London, he lost the quarterfinal but through repechage won the Bronze medal. def Anatolie Ilarionovitch Guidea (Bulgaria) 3-1.
lost to Besik Kudukhov (Russia) 3-0.
def Jong Myong Ri (North Korea) in Bronze medal Match.